Many people have taken issue with the inscription on the Franklin statue in Waterloo Place, which awards Sir John and his men credit for discovering the Northwest Passage, echoing Sir John Richardson's encomium that "they forged the last link with their lives." In John Walker's film Passage (based on Ken McGoogan's book Fatal Passage), the film's director visits the statue in the company of Inuit politician and businessman Tagak Curley, who laughs as he reads out the inscription, calling it a lie and declaring that "Dead men can't discover anything"! Tetqataq and Ukuararssuk tell that they were with Mangaq on the west shore of Ki-ki-tuk (King William Island) with their families sealing, and this a long time ago. They were getting ready to move -- it was in the morning & the sun was high -- when Tetqataq saw something in the distance on the smooth ice, something that looked white; he thought it was a bear. As soon as Tetqataq saw this something white, he told his companions of it, and they all waited, hoping it was a bear. As they watched, the white object grew larger, for it was moving towards them. At length they began to see many black objects along with what they had first espied as white in the distance. The object that they had 1st seen as white proved to be a sail raised on a boat & as they got nearer they saw this sail shake in the wind. As the object grew plainer, they thought of white men and began to be afraid. As the company of men (strangers) & the boat they were pulling got quite near, 2 men came ahead of the others and came across the ice towards where the Innuits were standing looking out, which was on the land, and the 2 men (Kabloonas) came walking up to where they were. Tetqataq and Ukuararssuk started to meet them, walking there on the ice. When they came to a crack in the ice, they stopped for the two white men to come up. The 2 white men came closer; one had a gun which he carried in his arms. This one stopped behind -- a little back -- white the other man came up as close to the 2 Innuits as the crack in the ice would allow him. The 1st man showed that he had an oo-loo (knife) when he stopped down beside the ice crack and made a peculiar kind of circling motion with the oo-loo. Right after that, he put his hand up to his mouth and lowered it all the way down his neck and breast, as if to say he wanted to get something to eat. Then the two white men moved over to the side, till they found a place where they could cross over to the 2 Innuits. Them the 1st man, who was Aglooka, spoke to them, saying "Man-nik-too- me," at the same time stroking 1st one and then the other down the breast, and also shook hands with each, repeating "Man-nik-too-me" several times. Aglooka pointed with his hand to the southward & eastward & at the same time repeated the word I-wil-ik. The Innuits could not understand whether he wanted them to show him the way there or simply to tell them that he was going there. He then made a motion northward & spoke the word "oo-me-en," making them to understand there were 2 ships in that direction. As Aglooka pointed to the N., drawing his hand & arm from that direction, he slowly moved his body in a falling direction and all at once dropped his head sideways into his hand, at the same time making a kind of combination of whirring, buzzing, & wind blowing noise. This was taken as a pantomimic representation of ships being crushed in the ice. The account was given to Charles Francis Hall in 1869, a little more than twenty years after the events recounted -- and when Knud Rasmussen interviewed Mangaq's son Iggiararjuk in 1923, he recounted the same story, exact in every detail. He said that the white men "were not met with again, and no one knows where they went to." Hall, like McClintock before him, knew where at least some of them had gone: westward, along the southern coast of King William Island, there lay a string of skeletons, buried and unburied, to mark the way. The story is significant because of its location; as shown on Gould's map, the encounter took place at the edge of Washington Bay, at Cape Herschel. And it was here, at this very spot, that Dease and Simpson erected a cairn on August 25th 1829, as they were surveying the northern "coast" of North America, extending the previous surveys of Franklin himself. 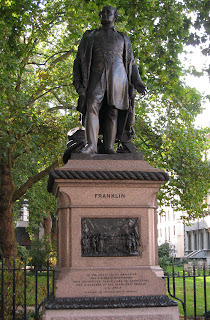 Thus, both on the basis of Inuit testimony, and on the skeletons of Franklin's men, we know for a fact that the "last link" between the areas Franklin discovered earlier in his final expedition, and the surveys heading eastward, was traversed by his men. True, they did not manage to live long enough to relay this discovery to the rest of the world, and true too that the route they'd trudged beside was too choked with heavy, multi-year ice to ever be navigable by the kinds of ships they sailed. But unlike the body of George Mallory, found hundreds of meters below the ridge leading to the summit of Everest, these bodies were found beyond the point at which the two known surveys were connected. So while of course the Victorian cult of the Polar hero, its themes conducted to a roaring crescendo by the astute and persistent efforts of Franklin's widow, Lady Jane, had everything to do with the erection of this statue and its inscription, I think that it's hard to find fault with its concluding phrase -- Franklin's men did indeed forge the last link -- and paid for it with their lives.